Just google search for 'star wars rebels streaming'. There are some anime sites that have the show up, just don't expect it to be HQ. Just because it's on Netflix and because I wanted some background noise while building a SW model, I put on season one of Clone Wars- I was blown away by how much better even season one looks compared to Rebels. Disapointing- I'm convinced the budget on Rebels is far far less than CW had- which seems crazy! You'd think Disney would want as much SW visibility as possible- and for the quality of the show to be the best possible too. Today they announced that the new movie is titled STAR WARS: The Force Awakens. I wish they would do something about these proportions, make them more human. It's getting too chibi. I think it's that their rendering software does not really do forced perspective properly - the hand remains the same relative size as though it was next to her body. When her arms are at her side, the proportions are much better- though non-hero females in CW (overall) certainly have big noggins- Ventress, Ashoka (older render), Barris seem okay- Luminara has a bit of a bobble head, but the habit she wears kinda adds to that. Bur what the heck- she's not human- and it's silly that every species looks so alike, with the same proportions and such. Saw "Droids in Distress" and "Fighter Flight" the other day. Threepio looked like he was made out of plastic. And somebody needs to throw Chopper out an airlock. Why make a new model for 3P0? Weird. Did it seem that the droids had been memory wiped? But that makes no sense either- it would mean 3P0 and R2 knew Luke was related to their former master- and knew Kenobi- and said nothing. So the personality is retained when the memory is wiped. Maybe personality and learned skills are retained while details of events are lost? That works for me- it would retain the value of an older droid (from learned skills and practical experiences) but would remove a droid's attachment to it's former owner. Threepio was, well, Threepio. His behavior was exactly the same, but he had no dialogue specifically saying that he had been memory wiped or not. Artoo, being incomprehensible, is even tougher to gauge. There was a scene towards the end of the episode with Bail Organa having a private "conversation" with Artoo, revealing that Organa was having Artoo spy on the Ghost crew, seemingly as a step towards forming the Rebellion proper. So, until we get some hard evidence, I would guess we are to take Organa's command at the end of Revenge of the Sith literally: Threepio was wiped, Artoo was not. Having watched up until episode 4, I have to say Rebels feels more mature than CW ever was. It has less cuddling, higher stakes, and more dramatic heft to it, ANH-style, with a stronger emphasis on the characters and the budding story. The birth of the Rebellion has a lot more potential for landgrabs and milestones, than to see the slow dismantling of the Republic in CW. Very early on, CW detached itself from being a personal story to which people could relate, in several ways; narrative focus never stayed on one person for long, jumping between Ahsoka, Anakin, Obi-Wan, the droids, Padme, even frigging Jar-Jar. It felt to me like an ensemble failure, just like TPM was; lots of babbling heads but no star. The time span of being set between AOTC and ROTS was also very limiting and frustrating ("soon all this will burn"). Secondly, I could never get over that corny announcer's voice used to catch people up to speed, it made all the events and plots sound undramatic and humdrum, like "Ahsoka must try to escape her 20th kidnapping", followed by "We now follow Ventress, who's having a monumental crisis of faith", and then "Will the droids be able to find enough fruit for Padme's party", all in the same 1970's Game Show Host voice. Reminds me of that awful and irritating "Star Wars Christmas Special " voice. That voice represents everything Star Wars tried not to be; folksy and wholesome. 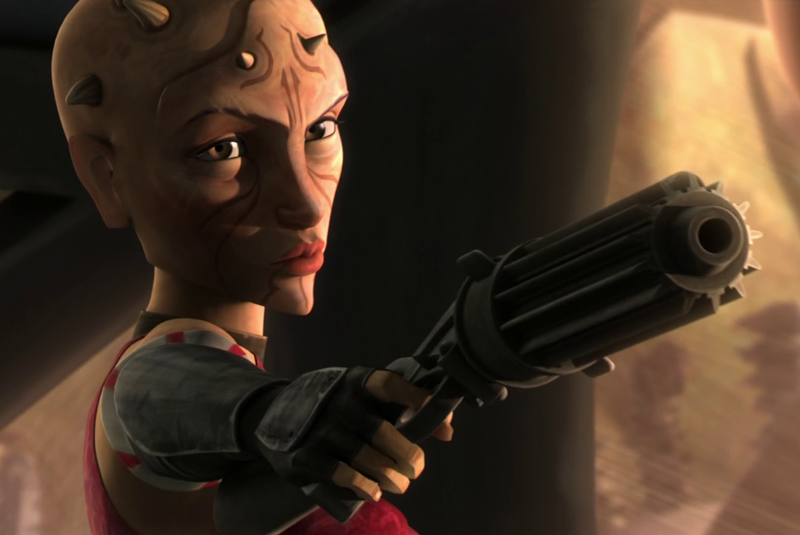 Thirdly, if Ahsoka was supposed to be the main character, or the "everyman" character through whose eyes viewers could view and understand the universe (like Samwise or Bilbo), she failed massively; by being very alien-looking and with a Rumpelstiltskin appearance, and jumping from dutiful, virtuous girlscout to incorrigible, scampering runt several times even in a single episode. Only a very small segment of the audience could identify with her (adolescent girls and some boys, between 9-15) or take interest in her miniscule and almost invisible character development (her head tufts grew a bit between seasons, and she broke down in tears less often). More importantly, she was introduced when she had already passed all the Temple tests and built her saber, the only things many fans were interested in. Instead she was trudging along as a witless Padawan scribe/assistant. No one knows what a Jedi cadet goes through, or how they start out (Yoda's regimen in TESB was a crash-course) and the ships Ahsoka flew had neither character, sentimental value, nor interesting features. In the case of "Rebels", not only do they emulate the sound effects and special effects of ANH, but also the power balance and narrative focus of characters; Ezra is the thieving orphan, we see him coming, he also has Force potential, but he has a long journey ahead of him, full of interesting exploration and Jedi learning, and he gets to hang out in an analogue of The Falcon, every fan's dream. Long story short: for now, I'm giving this show a hopeful thumbs-up. I have had to amend my opinion on the visual look and aesthetics of Rebels, I think the new rendition effects such as glistening Stormtrooper armor and detailed ship interiors actually are better made than in CW (all armor looked made of rubber), and facial expressions/non-verbal communication has stepped up a notch. 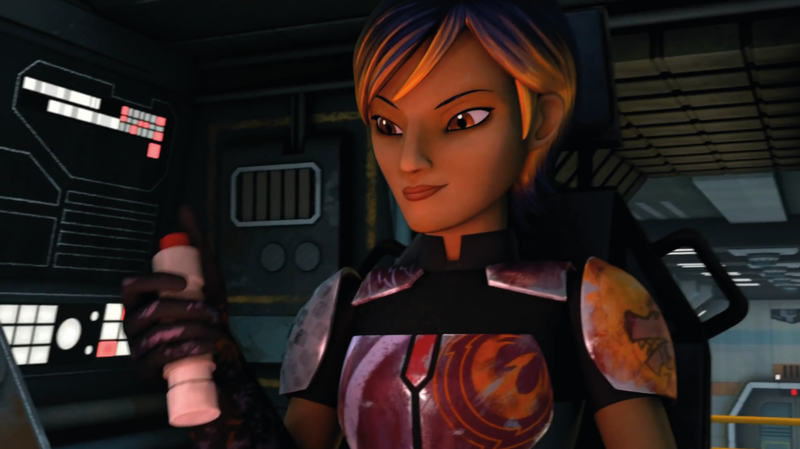 Some characters, though, like Sabine, still have faces which are a bit expressionless and static to be able to read. She works better with helmet on, in my opinion. I also thought Jason Isaacs made the Inquisitor a formidable antagonist, not too glib like Ventress of CW season 1-4, nor one-dimensional/boring/stuffy like Dooku, CW all seasons. The Inquisitor seems to prefer some of that gentleman irony of Vader's in ANH/TESB, with a little aristocratic derision borrowed from Lucius Malfoy, no doubt. And his weird lightsaber actually has useful features, which is a nice change. I really enjoy the overall thinner lightsaber blades, like in ANH, feels more dangerous. The thick, rubbery blades in CW could sometimes make a duel seem like a fight between airstrip signal men. Although the Stormtroopers are very weak and easily disposable, instead of bleeding and suffering, at least they are people, and not Temuera Morrison bores. And, most importantly, not slapstick battle droids. The Ghost also grew on me fast, the front silhouette of the canopies and the beefy bow section give it a very imposing look when landing, and the fact that it can pick up cargo with loading clamps is very useful in past and future scenes. Sure, the show can still go down in flames due to mismanagement, but I think it has a much greater chance of going somewhere than sputtering out in a confused, aimless whimper, like CW. Oh, and Fabrux? Threepio's leg on the Tantive IV. All is good in the land of the canon. Looking at that screenshot again, I am amazed that they understood already in 1977 how important it is that spaceship interiors don't have walls meeting the floors straight, which would've made Tantine IV look like a classroom or an old "Doctor Who" set. Curved wall ends and ceilings give that futuristic sci-fi feeling. "...1970's Game Show Host voice." I always thought that was meant to be a 1940s newsreel announcer voice. TSN, that's exactly what it was intended as- remember, Star Wars (CW in particular) is Lucas' sci fi version of the old movie serials he loved as a kid- if you go to starwars.com, there's a great interview with the writers explaining how CW had stories from all of Lucas' inspirations for Star Wars- the Godzilla/Zillobeast, the Seven Samuari/bounty hunters defending the village, zombies/ Geonosian worm parasites, Sink the Bizmark/Destroy Melavolence, etc. Soooo right- recall that back then, you had film makers hiring NASA engineers as consultants- Ridly Scott notably did that for Alien, and of course it all started with Stanley Kubrick's obsesive attention to details on 2001: A Space Odyssey. Gotta say, NIM, I don't agree with you at all about Rebels being more "mature" than CW- everything I've seen really seems to be toned down- there's very little people wherever they go- even to an Imperial base, it all seems deserted. I think that's an indication of a seriously smaller budget than CW, which often had crowded streets and many background characters. The effect makes it seem more like an old 80's cartoon- where only the bare minimum of characters would be in any episode to save animation costs. You'd think that they could simply use 3D character models from CW- they made a LOT of background people and tweaked (clothes mainly) them for whatever planet was being used. Also annoying is that several stormtroopers have had the ol' "GI Joe" treatment- where they should not have survived yet somehow do- despite that, there's also this slapstick violence with the stormtroopers that makes them seem even less effective a fighting force than in the movies. The Imperial officers are laughably lame- not so much the guy with the porkchop sideburns, but the rest are charitures of the OT's officers. I know it's a cartoon, but the officer running the training camp had a head so stretched as to look inhuman. I dont know- I love the ghost and the hero charcater designs (except the kid's anime-blue hair), but the episodes I've seen come arcoss as halfhearted compared to the cinematic quality CW had in it's last three or four seasons. Gotta say, NIM, I don't agree with you at all about Rebels being more "mature" than CW- everything I've seen really seems to be toned down- there's very little people wherever they go- even to an Imperial base, it all seems deserted. That's not how I gauge maturity in a dramatic presentation. I meant that the horrible revelation of Luminara Unduli, and the body count of Stormtroopers and others may point to an ambition to go back to Original Trilogy levels of drama. At least that's what I hope.